A critical requirement for testing a component in-circuit is to ensure good electrical contact with the pins of the device being tested. Although there are many commercially available test clips, they are often fragile and limited to the more common device package types. Diagnosys has designed and developed an extensive range of robust and reliable DTIs (Device Test Interfaces) for in-circuit test of ICs in a test environment. This range includes DTIs for fine pitch devices, through-hole devices and underside probing. In addition to this standard range, custom DTIs can be provided to accommodate the many varied and diverse package designs you may encounter. While all test interfaces will eventually see some wear and tear, the Diagnosys DTIs are also designed to be repaired, not thrown away! PinPoint Alpha is an affordable high specification test system which can be upgraded with functionality and performance as required, offering scalable architecture and performance. It is available in 3 slot (PinPoint Alpha) or 10 slot (PinPoint Sigma) options. The PinPoint Alpha system is a flexible, adaptable and modular PCB and IC fault finding system, which allows you to apply different electronic test methods to obtain maximum test coverage and fault detection. Test signals can be applied at the PCB edge connector or through test clips and DTIs to perform fixtureless in-circuit testing. The PinPoint Alpha has been designed to provide modular expansion of test resources and has 3 external slots available for Digital, Universal and Matrix switching channels. Providing a solid foundation in the standard configuration it can be tailored to provide the test resources you require in a cost effective manner. Addressing the latest and legacy technology PCBs, the PinPoint Alpha is a compact and transportable system delivering excellent PCB fault screening, PCB test and fault diagnostic capability where needed. PinPoint Sigma is a modular, high specification test system, which can be upgraded with functionality and performance as required. The affordable scalable architecture provides you with high specification test capability while delivering industry-leading performance. The PinPoint Sigma is designed as an affordable, flexible and modular PCB test and fault finding system. With the ability to apply multiple different test methods at the PCB edge connector or to each IC and device in-circuit through a test clip or DTI you can achieve excellent test coverage and accurate and reliable PCB fault finding. The PinPoint Sigma has been designed with flexible and modular expansion of test resources having 10 configurable external slots available for Digital, Universal and Matrix routing channels. The system can be tailored to provide the test resources you require in a cost effective manner and then be expanded to meet any changing requirements when required. Addressing latest and legacy PCBs, the PinPoint Sigma offers a compact footprint while being transportable to provide industry leading PCB fault screening, PCB troubleshooting, PCB test and fault finding where needed. The PinPoint II R system performs functional tests on individual components using in-circuit test methods and a fixtureless clip technique. These dynamic digital and analog tests prove the correct operation of each device and can also detect open circuit tracks or incorrect, broken or missing passive components on networks. These digital tests can also be applied at the edge connector of a circuit to prove the functionality of the whole circuit. When used for component level diagnostics, PinPoint II R gets to the heart of a problem, minimizing PCB re-work by identifying a fault to the actual component or network, precisely and accurately. To ensure safe in-circuit testing the PinPoint II R conforms to stringent back-driving controls and requirements. The Diagnosys PinPoint II R provides industry-leading capability for the test and fault finding of the most challenging PCB (or CCAs). Allowing you to select and apply different test techniques on a single circuit, you can ensure maximum fault coverage. Conforming to defense standards for electronic, physical and environmental requirements, including the handling of ATML test result data and having US National and NATO stock numbers, the PinPoint II R is the preferred choice for many defense organizations. Providing a wide range of test capabilities, including the optional integration of PXI and GPIB instruments, the PinPoint II R delivers excellent test and reliable diagnostic results. The PinPoint II R is also available in an industry standard 19” rack mounted version to facilitate integration with functional test systems. In this format it provides a Diagnostic Sub-System for the test and fault finding of PCBs. an industry leading PCB fault finding capability in a 19” rack-mounted format. Having the full functionality of the PinPoint IIR and using the same software, the PinPoint DSS provides in-depth diagnostic capability to any functional test system. 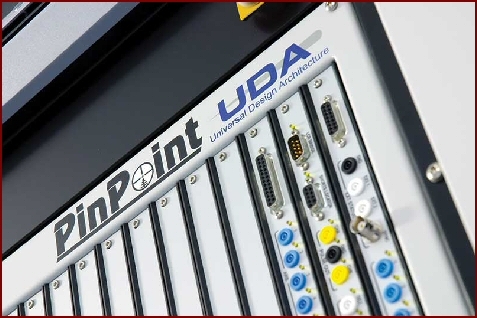 The PinPoint DSS can also be configured as a powerful test system controller where the 19” rack-mount format allows the integration of specialized test instrumentation while providing a compact footprint. In the DSS (Diagnostic Sub-System) format, PinPoint test and PCB fault finding technology is made available in an industry standard 19” rack-mounted format. Combined with the Diagnosys Test Result Server software, the PinPoint DSS has the ability to analyze, use and update test results from the S500 Functional Test System, or any other functional test system, to provide a powerful PCB diagnostic capability. Alternatively, for applications requiring the close integration of specialized test instrumentation with digital test and in-depth diagnostic capability, the PinPoint DSS can be configured as a powerful test system controller.